27/09/2018 Penguin ISBN: 9780241317020 £8.99 <!- Social Mobility and its Enemies --> Apart from the USA, Britain has the lowest social mobility in the Western world. The lack of movement in who gets where in society - particularly when people are stuck at the bottom and the top - costs the nation dear, both in terms of the unfulfilled talents of those left behind and an increasingly detached elite, disinterested in improvements that benefit the rest of society. This book analyses cutting-edge research into how social mobility has changed in Britain over the years, the shifting role of schools and universities in creating a fairer future, and the key to what makes some countries and regions so much richer in opportunities, bringing a clearer understanding of what works and how we can better shape our future. Find out about the book launch event that took place in October. Purchase this book from the publisher. 01/04/2015 Routledge ISBN: 9780415529228 (paperback); ISBN: 9780415529211 (hardback) £26.99 and £95.00 <!- Making a Difference in Education --> This book discusses whether education policy has really been guided by the evidence, and explores why the failings of Britain's educational system have been so resistant to change, as well as the success stories that have emerged. Making a Difference in Education looks at schooling from early years to age 16 and entry into Further Education, with a special focus on literacy, numeracy and IT. Reviewing a large body of research, and paying particular attention to findings which are strong enough to guide policy, the authors examine teacher performance, school quality and accountability, and the problematically large social gap that still exists in state school education today. Each chapter concludes with a summary of key findings and key policy requirements. As a comprehensive research review, Making a Difference in Education should be essential reading for faculty and students in education and social policy, and of great interest to teachers and indeed to anyone who wants to know about the effectiveness of UK education policy and practice, and where they should be going. Making a Difference in Education: What the Evidence Says - LSE Public Lecture Podcast recorded on 6 May 2015. 21/12/2014 Princeton University Press ISBN: 0691152845; 978-0691152844 £24.95 <!- Mastering Metrics --> Applied econometrics, known to aficionados as 'metrics, is the original data science. 'Metrics encompasses the statistical methods economists use to untangle cause and effect in human affairs. Through accessible discussion and with a dose of kung fu-themed humor, Mastering 'Metrics presents the essential tools of econometric research and demonstrates why econometrics is exciting and useful. The five most valuable econometric methods, or what the authors call the Furious Five -random assignment, regression, instrumental variables, regression discontinuity designs, and differences in differences--are illustrated through well-crafted real-world examples (vetted for awesomeness by Kung Fu Panda's Jade Palace). Does health insurance make you healthier? Randomized experiments provide answers. Are expensive private colleges and selective public high schools better than more pedestrian institutions? Regression analysis and a regression discontinuity design reveal the surprising truth. When private banks teeter, and depositors take their money and run, should central banks step in to save them? Differences-in-differences analysis of a Depression-era banking crisis offers a response. Could arresting O. J. Simpson have saved his ex-wife's life? Instrumental variables methods instruct law enforcement authorities in how best to respond to domestic abuse. Wielding econometric tools with skill and confidence, Mastering 'Metrics uses data and statistics to illuminate the path from cause to effect. Read the reviews, table of contents, or download the introduction and the first chapter (in PDF format). 01/07/2014 Allen Lane / Penguin ISBN: 9781846146053 £20.00 <!- Thrive--> A ground-breaking argument for better treatment of mental health from Richard Layard (author of Happiness) and David M. Clark. Britain has become a world leader in providing psychological therapies thanks to the work of Richard Layard and David Clark. But, even so, in Britain and worldwide the majority of people who need help still don't get treatment. This is both unjust and a false economy. This book argues for change. 01/01/2014 Grup 62 ISBN: 8499422829; 9788499422824 Euro 17.90 <!- El Dilema De Espa&ntilde;a--> Spain is at a historic crossroads. On the one hand, the country could follow the easy path of populism and statism - a 'Hispanic' road to underdevelopment that is exemplified by Venezuela and Argentina, and which has always tempted Spanish politicians. On the other hand, the country could choose a path that requires substantial changes in the short term but would result in a more productive society and economy. Choosing the second path involves implementing reforms in at least three priority areas: education, focusing on developing analytical skills rather than rote memory; economic institutions, enhancing the transparency of markets; and political institutions, improving the quality of political leaders and making them more accountable to citizens. In this book, the economist and LSE professor, Luis Garicano, advocates the second route, based on human capital investment, profound reforms to the state and justice system, and enforced compliance with the law. He proposes a workable vision of what Spain needs to do to exit its current crisis. 01/09/2013 LSE ISBN 978-1-90-989002-2 £19.99 <!- Investing_for_Prosperity--> Why is economic growth such a rare and elusive butterfly in the UK garden? What institutions and policies are needed to sustain UK economic growth in the dynamic global economy of the twenty-first century? After years of inadequate investment in skills, infrastructure and innovation, there are longstanding structural weaknesses in the economy, all rooted in a failure to achieve stable planning, strategic vision and a political consensus on the right policy framework to support growth. This must change if we are to meet our current challenges and others that may arise in the future. Despite the current recession gloom, the UK has many assets that can be mobilised to its advantage. It has strong rule of law, generally competitive product markets, flexible labour markets and a world-class university system. It has strengths in many key sectors, with cutting-edge firms in both manufacturing and services. These and other assets helped to reverse the UK's relative economic decline over the century before 1980. This book, based on the work of the LSE Growth Commission and greatly expanding upon its first published report, argues that the UK should build on these strengths and proposes how we can address the inadequate institutional structures that have deterred long-term investment to support our future prosperity. The book is edited by Professors Tim Besley and John Van Reenen at the London School of Economics and Political Science. It develops on the themes outlined in the Commission's first brief report published in January 2013. The Commissioners and contributors also include: Philippe Aghion, Lord John Browne, Francesco Caselli, Sir Richard Lambert, Rachel Lomax, Christopher Pissarides, Lord Nicholas Stern, Nitika Bagaria, Novella Bottini, Miguel Coelho, Joao Paulo Pessoa, Isabelle Roland and Jennifer Kao. 01/05/2011 OUP ISBN 978-0-19-960978-9 £35.99 <!- Combatting Unemployment--> Combatting Unemployment is a collection of key papers from seminal labour economists Richard Layard and Stephen J. Nickell. Why is unemployment higher in some countries than others? Why does it fluctuate between decades? Why are some people at greater risk than others? Layard and Nickell have worked on these issues for thirty years. Their famous model, first published in 1986, is now used throughout the world. It asserts that unemployment must be high enough to reduce the real wages for which workers settle to the level justified by productivity. So what affects 'wage push'? The authors showed early on that the key factors affecting 'wage push' are how unemployed workers are treated and how wages are negotiated. If unemployed people get benefits without being required to accept jobs, vacancies go unfilled and mass unemployment results. The solution is welfare-to-work policies like those now introduced in most parts of the world. The authors have proposed these policies for the last twenty-five years in a series of key articles reproduced in this book. Their original analysis explains the subsequent movement of unemployment over the last two decades. They conclude the book with a new chapter on what should be done in the recession: no-one, they say, should be given unemployment benefit beyond a year, after which they should be offered work. 01/04/2011 Penguin ISBN 978-0-24-195279-5 £9.99 <!- Happiness--> In this new edition of his landmark book, Richard Layard shows that there is a paradox at the heart of our lives. Most people want more income. Yet as societies become richer, they do not become happier. This is not just anecdotally true, it is the story told by countless pieces of scientific research. We now have sophisticated ways of measuring how happy people are, and all the evidence shows that on average people have grown no happier in the last fifty years, even as average incomes have more than doubled. In fact, the First World has more depression, more alcoholism and more crime than fifty years ago. This paradox is true of Britain, the United States, continental Europe, and Japan. What is going on? Now fully revised and updated to include developments since first publication, Layard answers his critics in what is still the key book in 'happiness studies'. 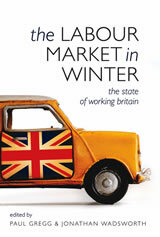 01/01/2011 Oxford University Press ISBN 978-0-19-958737-7 £30.00 / $55.00 <!- The Labour Market in Winter --> This collection of essays - by leading economic experts on the UK labour market - provides an overview of the key issues concerning the performance of the labour market, and the policy issues surrounding it, with a focus on the recent recession and its aftermath. The result is the first comprehensive analysis of the economic downturn and the Labour government's record in the fields of employment, education, and welfare. The result is the first serious comprehensive analysis of the economic downturn and the Labour government's record in the field of employment, spanning its time in office. An indispensable reference source on contemporary labour market developments in the UK, this book will be required reading, and of lasting use, to academics, students, practitioners, and policy makers. 01/12/2010 MIT Press ISBN-10: 0-262-01463-7; ISBN-13: 978-0-262-01463-2 £25.95 / $35.00 <!- The Comingled Code --> Discussions of the economic impact of open source software often generate more heat than light. Advocates passionately assert the benefits of open source while critics decry its effects. Missing from the debate is rigorous economic analysis and systematic economic evidence of the impact of open source on consumers, firms, and economic development in general. This book fills that gap. 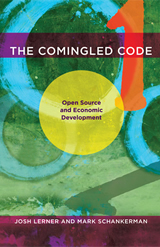 In The Comingled Code, Josh Lerner and Mark Schankerman, drawing on a new, large-scale database, show that open source and proprietary software interact in sometimes unexpected ways, and discuss the policy implications of these findings. The new data (from a range of countries in varying stages of development) documents the mixing of open source and proprietary software: firms sell proprietary software while contributing to open source, and users extensively mix and match the two. Lerner and Schankerman examine the ways in which software differs from other technologies in promoting economic development, what motivates individuals and firms to contribute to open source projects, how developers and users view the trade-offs between the two kinds of software, and how government policies can ensure that open source competes effectively with proprietary software and contributes to economic development. Editorial regarding programs written by volunteers. It is mentioned that John Lerner and Mark Schankerman, professor at Harvard Business School and the LSE have written 'The Comingled Code'. 01/09/2010 LSE ISBN-10: 085328458X; ISBN-13: 978-0-85-328458-1 £14.99 <!- The Future of Finance --> This book presents a novel approach to the reform of the world&rsquo;s financial system, starting with the basic question, what is a financial system for? It shows that the existing system has become far more complicated than it needs to be to discharge its functions &ndash; and dangerously unstable into the bargain. It proposes some drastic remedies. 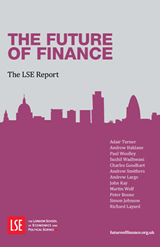 The Future of Finance: The LSE Report is the work of a group of leading academics, financiers, journalists and officials from the UK&rsquo;s Financial Services Authority, the Bank of England and the Treasury. They met twelve times, for what many of those present described as the best and most searching discussions they had ever participated in. The first author is Adair Turner, chair of the Working Party of the G20 Financial Stability Board reporting to the G20 Summit in November 2010; the others are major international players in policymaking or public debate. 05/02/2009 Penguin ISBN-10: 0141039434; ISBN-13: 978-0-14-103943-5 £9.99 <!- A Good Childhood --> Every day the newspapers lament the problems facing our children - broken homes, pressures to eat and drink, the stress of exams. The same issues are discussed in every pub and at every dinner party. But is life really more difficult for children than it was, and if so why? And how can we make it better? This book, which is a result of a two year investigation by the Children's Society and draws upon the work of the UK's leading experts in many fields, explores the main stresses and influences to which every child is exposed - family, friends, youth culture, values, and schooling, and will make recommendations as to how we can improve the upbringing of our children. It tackles issues which affect every child, whatever their background, and questions and provides solutions to the belief that life has become so extraordinarily difficult for children in general. The experts make 30 specific recommendations, written not from the point of view of academics, but for the general reader - above all for parents and teachers. We expect publication to be a major event and the centre of widespread media attention. Richard Layard is Emeritus Professor of Economics at the London School of Economics, and author of the best-selling Happiness (Penguin, 2005). He was founder-director of the Centre for Economic Performance at the London School of Economics and now heads its programme on well-being. He is also a member of the House of Lords. Judy Dunn is Professor of Developmental Psychology at the Institute of Psychiatry, King's College London. Her research interests are in children's social, emotional and communicative development, studied in their families and with their friends. She is Chair of the Good Childhood Inquiry. 04/01/2009 Princeton University Press ISBN-10: 0691120358; ISBN-13: 978-0-69-112035-5 £54.00 and £24.95 <!- Mostly Harmless Econometrics --> The core methods in today's econometric toolkit are linear regression for statistical control, instrumental variables methods for the analysis of natural experiments, and differences-in-differences methods that exploit policy changes. In the modern experimentalist paradigm, these techniques address clear causal questions such as: Do smaller classes increase learning? Should wife batterers be arrested? How much does education raise wages? 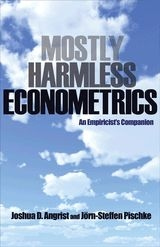 Mostly Harmless Econometrics shows how the basic tools of applied econometrics allow the data to speak. In addition to econometric essentials, Mostly Harmless Econometrics covers important new extensions - regression-discontinuity designs and quantile regression - as well as how to get standard errors right. Joshua Angrist and J&ouml;rn-Steffen Pischke explain why fancier econometric techniques are typically unnecessary and even dangerous. The applied econometric methods emphasized in this book are easy to use and relevant for many areas of contemporary social science. This book features: an irreverent review of econometric essentials; focus on tools that applied researchers use most; chapters on regression-discontinuity designs, quantile regression, and standard errors; many empirical examples; and, a clear and concise resource with wide applications. View the entertaining Mostly Harmless Econometrics website where you can read about the authors, download extracts, and even buy the T-shirt.